As per Ashtakvarga, in the horoscope every planet gives points to other house & planet from its position & house, the points represents the power. For example: Mars gives 1 point to third house, sixth house & tenth house from its position in the horoscope chart. In this picture Mars is in the 7th house, it gives 1 point to the ninth house which is 3rd house from its position and 1 point to 12th house which is 6th house from its position and 1 point to 4th house which is the 10th house from its position. (For the ease of my readers who are new in the astrology I would like to make it clear that counting from 1 to 12 in the chart is the symbol of zodiac sign i.e. Aries, Taurus etc. Ascendant always remains first house; in the present chart Gemini sign is in ascendant.) Read basics of Astrology or Horoscope. In this way, each & every house and planet of the horoscope gets points from each planet. Finally some house & planet may get more points, some may less. There may be maximum eight points and minimum zero. Point more than four represent the power while four or below display weakness. The house & planets of horoscope becomes powerful which gets more points & other house remains weak which gets less points. As per the Ashtakvarga, the planet will become very powerful if it gets six points. It will make the person rich & prosperous. The planet which is having 7 points will make the person popular and competent to do anything. It shows a big Rajyog. In the horoscope of a person, if any planet gets 8 points then the person shall definitely be a big celebrity. The planet will be very helpful for him to achieve a big position. 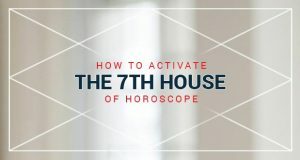 If you study the horoscope of ministers, big politicians, industrialists, film actors and celebrities, you will see one common thing that they all have one or more planet with 7 or 8 points in their chart. You would have observed on many occasions that two children are born at the same time; but later one became rich & other poor. One remains very simple & other become celebrity. The reason behind this is difference in the Ashtak varg. Ashtak varg make the one person’s horoscope chart very different from the other one. The Ashtak varg of the two person shall always be different it does not matter whether they are born on same time or not. We come to know the actual powers of planet with the help of Ashtakvarga. 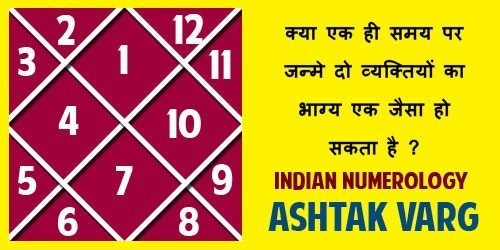 Once we have detected correctly that Sun Moon or all other have got more points as per the Ashtakvarga, we may predict that the person will be benefitted from them in his life and he will have no loss from the same. But the astrologers who are not aware about the Ashtakvarga or do not care about the Ashtakvarga may harm their clients by suggesting the wrong remedies. Therefore I would like to suggest my readers that whenever they visit any astrologer then they must ask him to check the horoscope chart Ashtakvarga point of view also. If he is having the knowledge of Ashtak varg then you can understand that he is big scholar in the field of Astrology and his prediction shall be accurate.